ISR welcomes a new Honda Visiting Scientist, Mr. Shigeru Narihiro. He is an engineer working on automobile engines at the Honda R&D Co. Tochigi Automobile R&D Center. 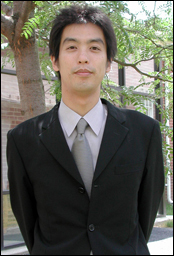 Mr. Harihiro will be visiting with us for 14 months and conducting control theory research with ISR-affiliated Associate Professor Dave Akin (AE) and Associate Professor Robert Sanner (AE).